In keeping with the October horror theme, next on the list of key issue comics is this gem of a comic. 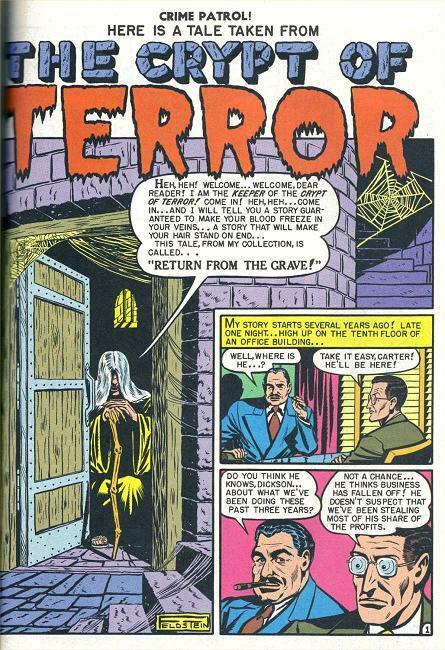 This historic comic introduced the first horror story to the E.C. line of comics, which would be what they were to become known for all these years later. 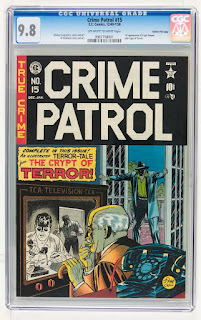 This comics holds the first appearance of the Crypt Keeper, who was made popular by the HBO show Tales from the Crypt that ran from 1989 to 1996. I have to admit, this was one of my favorite shows when I was growing up. The mixture of laughs and gore really caught my attention. If you've been keeping up with entertainment news, then you've seen that M. Night Shyamalan is going to reboot the series for TNT. I wonder how much of the gore and language that they can get away with on a cable network like TNT. However, I've noticed that it's gotten pretty gruesome on some shows like The Walking Dead. In earlier interviews with Shyamalan, he had the idea of creating a season long story line for the show, kind of like what American Horror Story does, but recently it seems he's going for more of a direct reboot of the original series, Crypt Keeper and all. I guess we'll have to wait and see. I, personally, am having mixed feelings about it. Enough about that, let's talk about this comic. As I'm sure you've all noticed, this is not a horror comic, but a true crime comic. In the beginning, EC decided that it would be a good idea to try out the idea of introducing a horror related story in these books to see if they would sell. As it turns out, that was a very good idea. 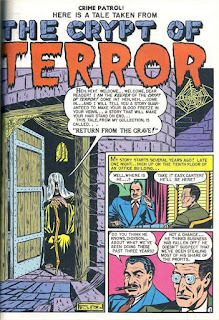 We are introduced to the Crypt Keeper and his Crypt of Terror in a short seven page story called Return From the Grave. In this short story, two executives are trying to swindle a company from a poor business owner. The business owner is so poor and down on his luck that the two executives convince him that he should commit suicide and make it look like and accident, so his family can collect on his life insurance policy. A short time later, the two execs get a phone call. Apparently the old man took their advice and jumped in front of a truck. Now that the two executives own the old mans company, they get a call for a large order of perfume. The factory that makes the perfume doesn't have the formula for it so the now the two panicked men try to find it. They find out that the formulas are in the pocket of the suit that the old man was buried in, so the two start digging, and find the coffin empty, except a small piece of paper with a note scribbled on it. The note said "I have discovered how you have stolen money from me for the last three years driving me to suicide. I have risen from my grave... and will not return until I have taken my revenge!" I don't want to spoil the ending, but in true EC style, the two executives get their just deserts. I've gotta tell ya, it wasn't easy to find a copy of this story to read. Not only that, It's also a hard comic to find. As on now, there have only been 40 copies graded by CGC. It's kind of a mixed bag of high to low grades, but surprisingly there are five, that's right, I said five 9.8 NM/M copies. I'm assuming that these are going to be the Gaines File Copies. Don't worry, If you don't know about the Gaines File Copy pedigree, I will be writing about it very soon. High grade copies of this comic are expensive, but they're not Action Comics #1 expensive. It's not going to cost you millions of dollars to add this to your collection. It may not even cost you tens of thousands. There was a CGC 9.8 NM/M Gaines File Copy that sold at Heritage Auctions for only $7468.75. Yeah, that's a lot of money, but for a piece of history like this, I think they got it at a bargain. However, There was a 9.6 NM+ Gaines File Copy that sold at Heritage a few years earlier in 2010 for $13,800. So, does that mean that interest in this comic is going down? Not likely. With comics like this, they hit the market so rarely that it can drive the price up or down, depending on how many people are interested at that particular time. The more people that know about the auction, the higher the price will go, and the less, the lower it will probably go. The information of the two other sales that I was able to get from GoCollect don't really tell me where this comic is headed in terms of value. There was one sale for a CGC 7.5 VF- that sold for a penny shy of $1,850 in April 2015, and a low grade 2.0 G that ended up selling for $412.05 in June of the same year. Like I said, it's hard to say where the values of this comic are going. I can tell you that there has been no change in value in Overstreet over the last two years. Horror comics are a genre that aren't collected by the masses like superhero comics are. Values will slowly rise within this small community of collectors. 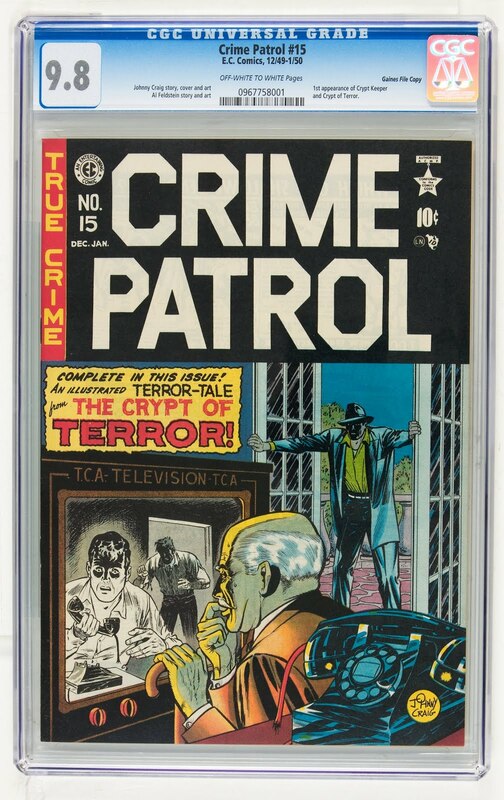 Since I'm a fan of horror comics, I have this one on my want list, but being able to afford a copy is a whole different story.